10andUnder Tennis – the sport that gives young children the opportunity to learn and develop their tennis skills as they grow. With 3 stages – Red, Orange, and Green – kids are given the tools to succeed with equipment and court sizes tailored to different age groups. Smaller courts, properly-sized racquets, and tennis balls designed to be played at slower speeds help children to learn fundamentals and grow into the game as they get older. 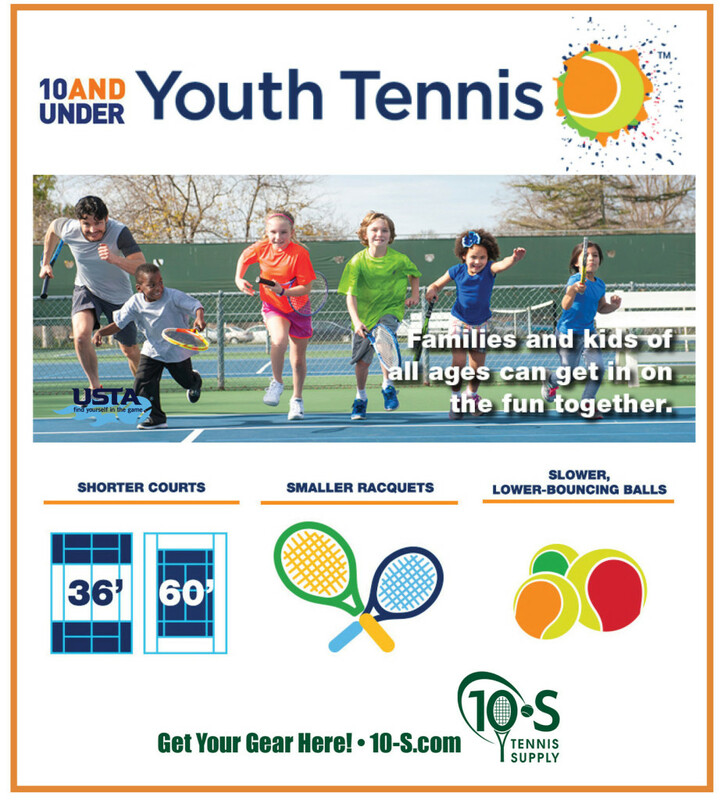 For a full range of 10andUnder Tennis supplies, please visit the 10-s.com website. Stage Red is for children 8 years old or younger, and is played on a reduced court size of 36′ x 18′. Oftentimes, these smaller courts are cordoned off using rubber lines (or lines and corners) in order to clearly mark the boundaries. Examples of these items can be found here on the 10-s.com website. This is the only stage in which there are two kinds of balls – red felt and red foam balls. The foam balls are a little larger, which can be especially helpful for the youngest players. These balls are the slowest moving and lowest bouncing balls available, perfect for beginners just starting out. The net height is 2′ 9″ at the center, and the recommended racquet size is up to 23″. It is easier for the kids to start building fundamentals with equipment and courts that are sized just for them. For the kids 9-10 years old, Stage Orange is better suited. While still smaller than a tennis court, the 60′ x 21′ court provides a sufficient area to continue building skills and fundamentals. Again, it is a good idea to clearly mark the boundaries of this smaller court. The orange stage balls have about 50% of the pressure of a standard tennis ball – giving it about half the speed and bounce. The net height for this level is that of a standard tennis net (3′ at center, 3′ 6″ at posts), and the recommended racquet size is 23″ – 25″. Stage Green is the final level before the kids start playing on a standard tennis court, with all the standard tennis balls and equipment. This stage is for those 11 years old and up, until they feel well-prepared for the adult sport. The players on this level take advantage of the full tennis court and net height, but the green stage balls have about 75% of the pressure of a standard tennis ball – giving it a slightly slower speed and bounce. The recommended racquet size for this level is 25″ – 27″. To better understand the different stages of play, the following chart demonstrates which stage of play is associated with each age group. Getting the kids involved with Youth Tennis is so easy and can benefit them for a lifetime! 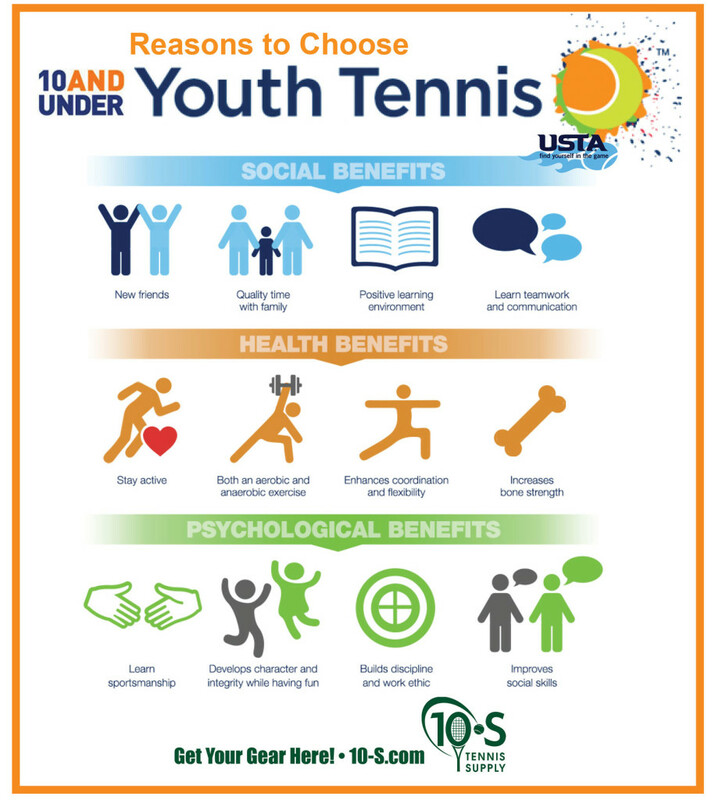 Learn all about it at youthtennis.com and order all of your supplies from 10-S Tennis Supply by clicking HERE. PRESS RELEASE: Fast-Dry Courts builds 10,000th 10 & Under Tennis Court in U.S.
WHITE PLAINS, N.Y., March 19, 2013 – The United States Tennis Association (USTA) today announced that it will celebrate the refurbishment and creation of 10,000 youth-sized tennis courts in the United States as part of USTA’s commitment to First Lady Michelle Obama’s Let’s Move! initiative. A special celebratory event, Court 10K, will be held on March 19 at the Tamiami Tennis Center in Miami to commemorate this exceptional milestone. The celebration will feature U.S. Fed Cup captain, Olympic gold medalist and Miami native, Mary Joe Fernandez. The host site, Tamiami Tennis Center, is emblematic of the 10,000 courts that have been installed throughout the country. The USTA teamed up with First Lady Michelle Obama’s Let’s Move! initiative in 2011 to encourage young people across the country to get active, play tennis and lead healthy lifestyles. In addition, a component of the collaboration with Let’s Move! was the commitment to encourage children to participate in the Presidential Active Lifestyle Award (PALA), in which more than 226,000 kids participated and completed the challenge through the USTA. To date, the USTA has had more kids complete the challenge than any other youth sports organization in the United States. Through its facilities assistance arm, the USTA has succeeded in the construction and renovation of more than 4,500 youth-sized tennis courts in 371 markets in 44 states throughout the nation in 2012. In all, the USTA has constructed or refurbished 10,000 kid-sized courts since 2005. The courts were built in public parks, school yards, tennis facilities and at local community based youth organizations, like the Boys’ and Girls’ Clubs. As part of this initiative, all courts that were built or renovated were specially lined to enable participation in the USTA’s youth participation initiative, 10 and Under Tennis. Youth tennis is geared toward getting more kids to participate in tennis using modified equipment and courts tailored to a child’s age and ability. By featuring shorter and lighter racquets, slower-bouncing balls, smaller courts and simplified scoring, children learn to play more quickly and easily while having more fun in the process. For the past two years, the USTA has invested significantly in 10 and Under Tennis, and the initiative is the organization’s number one recreational tennis initiative. In total, the USTA through its facilities assistance program, has built more than 35,000 tennis courts across the country in the past six years, for all ages and abilities to enjoy the sport of a lifetime. the Davis Cup, Fed Cup, Olympic and Paralympic Games. The USTA’s national charitable foundation, USTA Serves, provides grants and scholarships and helps underserved youth and people with disabilities. For more information on the USTA, log on to usta.com, “like” the official Facebook page, facebook.com/usta, or follow @usta on Twitter.